Adequate nutrition is essential to overall health and physical and mental development. Young people living in the slums need nourishing food, health assessment and basic care. Feeding more than 300 hungry children at the Good Samaritan Children’s Home in the Mathare slums is a continuing challenge. They range in age from a few months to 18 years of age. These young people need a balanced diet with adequate protein and enough nutritional value for normal growth and development. ACOHF supports a full-time cook who manages the kitchen and usually makes three meals a day. The cook prepares simple meals of ugali (cornmeal mush) or githeri (corn and beans). Porridge with milk nourishes the youngest children. 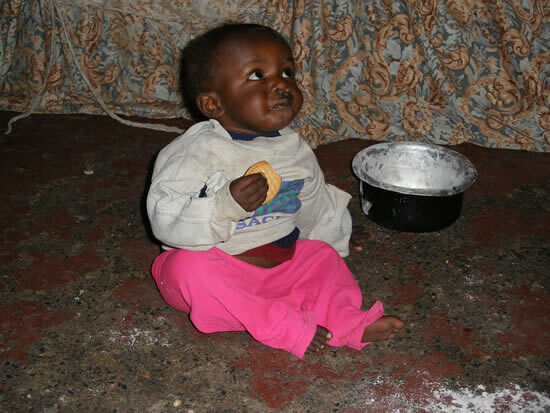 Sometimes on Sunday the older children help and everyone enjoys chapati (flatbread). Meat or fruit is a rare treat reserved for holidays or special occasions. ACOHF helps to provide flour, rice, beans, maize (corn), cooking oil and other essential food supplies. Single mothers who are HIV+ also need proper nutrition to sustain themselves and their children. ACOHF provides regular nutrition supplements to the Meru Association of Positive People and families impacted by AIDS. This assistance includes beans, rice, corn, flour, cooking oil, and tea. We also help fund nourishing hot meals for the members of this AIDS support group during their biweekly meetings at Thiiri Community Centre in Meru. 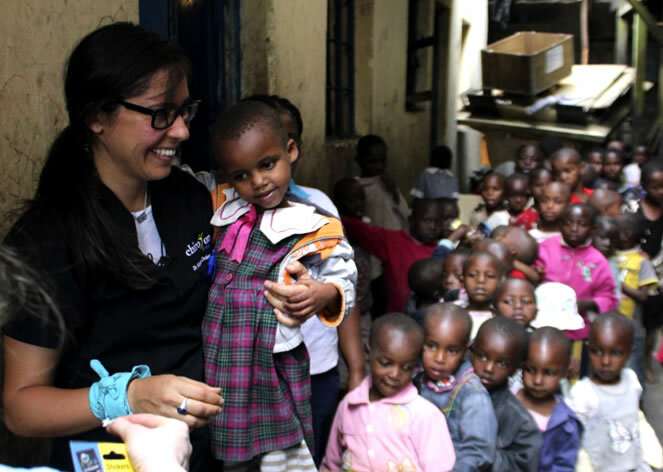 ACOHF provided support for a community health team that traveled to Kenya to provide some initial assessment and health care for orphans at the Good Samaritan Children’s Home in the Mathare slums. The team of dedicated volunteers included experienced health professionals from Loyola University Chicago Nursing School, Chiro One Wellness Centers in Chicago, and Northwestern University. They coordinated with faculty and students from the Regina Pacis University College Nursing School in Nairobi. The most common ailments they found in the children were skin diseases, fungal infections, worms and parasites. The team took in medical supplies and provided basic treatment to these children. A chiropractor also assessed and adjusted the children as needed for disorders of the musculoskeletal system, which affect general health with back pain, neck pain, pain in the joints of the arms or legs, and headaches. The community health team donated medical supplies, training materials, medical equipment, resource books and scrubs to faculty and students at Regina Pacis University College Nursing School in Nairobi. These local nursing students will continue to visit Good Samaritan to assess and monitor the general health of the children in this community. Other support may include assessment of the physical and emotional status of each child, basic treatment, medical supplies, transportation to a clinic or hospital, nutritional training, specialized community health workshops, and other resources and services as required. The community health team members with expertise in childhood trauma have provided basic training for nurses, teachers, social workers, and caregivers in Kenya to help them better assess and respond to children or young adults who have experienced neglect and physical and emotional trauma. Many of the orphaned and abandoned children living at Good Samaritan have known great loss, and have been exposed to significant violence and abuse before being rescued. Because trauma impacts emotional health as well as the way the brain understands information, trauma can negatively affect attention and performance in school as well as socialization and overall health and well-being. Child trauma training and relevant resource materials also helped teachers, nurses and caregiver systems to understand more about the psychology of trauma and to manage and support learning in a classroom or in other contexts from a trauma-informed approach. Certified professionals on the team also conducted screenings to identify those who may be at risk for mental health issues. Tutoring, counseling and mentoring are part of our integrated educational programs to provide students with the additional support, skills and confidence they need to be successful in the classroom and effective in their communication and interactions with others.